This was our first home, my first solo design project as well as my first foray into development. Many valuable lessons learned within this impossibly minuscule rehab budget that continue to influence my practice today. 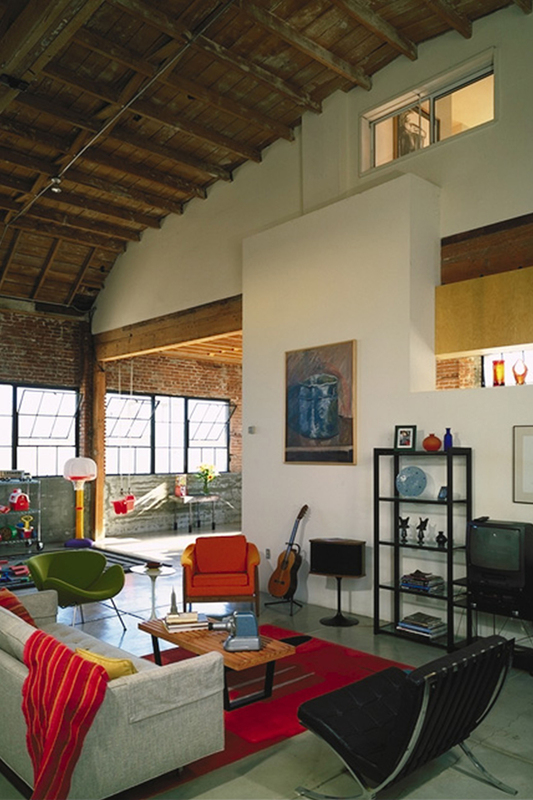 This project entailed converting a dilapidated 1921 industrial warehouse downtown into a practical yet stylish urban residence (for my then young family of four) and two rental lofts. This was our first home, my first solo design project as well as my first foray into development. Many valuable lessons were learned trying to accomplish a lot with the impossibly minuscule rehab budget of $19/sf that continue to influence my practice today. I learned to edit, reduce, and clarify the concept to only the bare essentials of good natural light and volume. The interior was completely gutted and the exterior was stripped of 20 plus coats of paint resulting in a simple, but handsome natural brick facade, quite unique in San Diego. Adding a kitchen and bathroom along with installing salvaged industrial windows, metal stairs and roll-up garage doors completed the transformation. The expansive open volume, indestructible construction and lofty quirkiness facilitated all sorts of childish fun; an excellent high-flying swing, a tricycle track, and the venue for intense family games of indoor wiffle ball.